Last season, the River Ridge Knights won a total of three games. However, the Knights opened the 2017-2018 regular-season by winning their first four games and in large thanks to the team’s senior captain, Anthony Loiacano. In fact, River Ridge has won nine games this season and the team has had a number of impressive performances. While it’s evident on paper that this season is “different” for the Knights, it became even more obvious after speaking with Loiacano that River Ridge is truly embracing the moment. The five-foot-eleven defenseman was asked if this year’s team has been a more memorable group than team’s he’s played with in the past, too. While Loiacano didn’t bring up his personal success from this season, there’s no doubting that he’s having one of his best all-around campaigns. The 180-pound defenseman has 11 goals and 12 assists for a total of 23 points through 18 games played. To put things in perspective, number 13 for the Knights had 26 points all of last season, so one could be sure that Loiacano will surpass that number this season. The youngster was also sure to bring up one of the team’s more memorable moments in recent memory, as River Ridge became the first team this season to defeat (at the time) an undefeated East Lake Eagles squad back on October 27th. Entering the Bradley Division contest East Lake was the lone LHSHL team that hadn’t lost a game, but Loiacano and company pulled off an exciting victory. “I really enjoyed beating East Lake this season and that was definitely the highlight of the season so far,” said Loiacano on the team’s 3-2 win. River Ridge’s captain found the back of the net once during the rivalry matchup, and had the secondary assist for the game-winning goal. Even one of Loiacano’s longtime teammates commented on his play from that night. 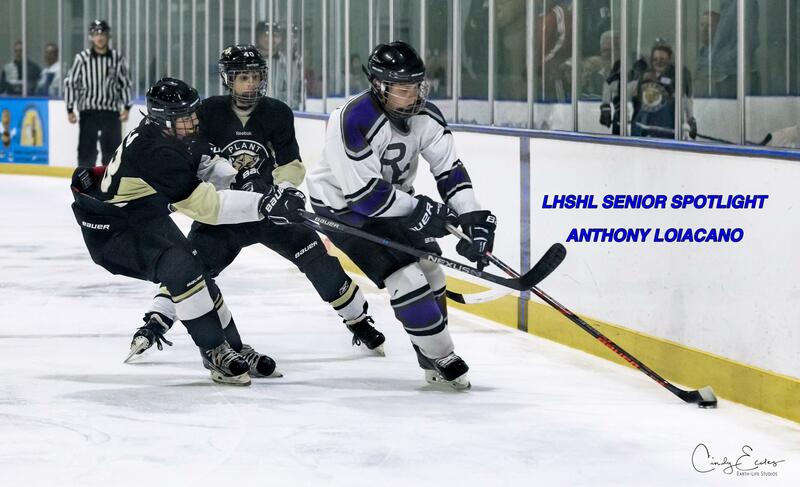 “I’ll never forget Anthony going coast-to-coast and sniping (East Lake goaltender) Anthony Samarkos short side, and tying us up with East Lake this year,” said River Ridge goaltender Daniel McCarthy. 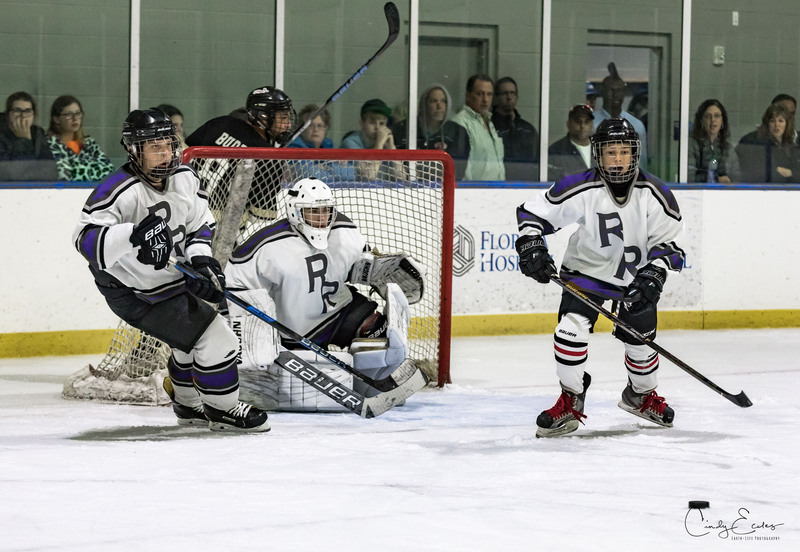 Yes, if one were to watch number 13 for River Ridge take to the ice, it’s apparent that he’s a smooth skater and offensively talented; but the senior is also defensively-sound and does a commendable job at shutting down the opposition’s top skaters, too. While Loiacano is one of the league’s most talented two-way players this season, one could describe him as a humble and quiet leader. “Anthony is a quiet leader and wants to lead by example,” added the River Ridge Head Coach. With those characteristics mentioned above, one could also picture that Loiacano’s composure and calmness on and off of the ice as a teammate is admirable, too. 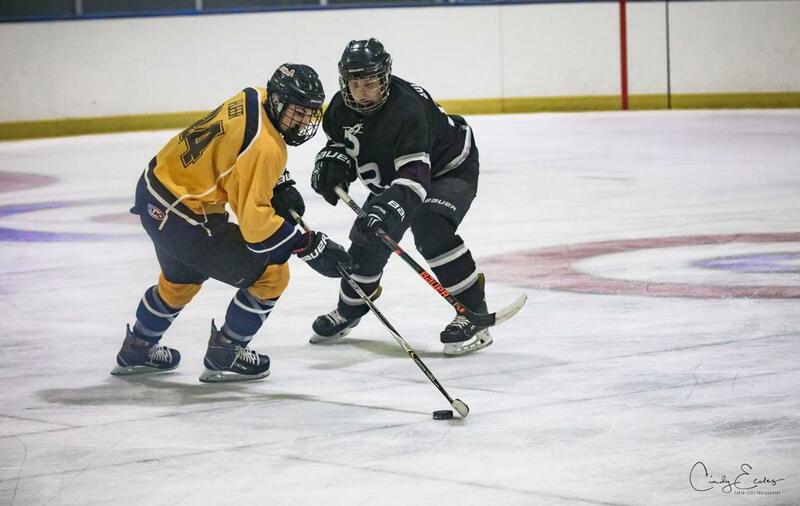 The dynamic D’man has received recent recognition from other players and teams around the league, which also included the current LHSHL leading goal-scorer in Zach Katz of the Seminole Sharks. Yes, Katz and Loiacano have been competing against each other in the LHSHL over the past few seasons, but the two are also new teammates for their U18 “AA” Travel Ice Hockey Team (Gulf Coast Flames). As mentioned above, most would agree with Coach Loiacano that his team’s captain is “tough” to knock off the puck, especially when he rushes the puck up ice and goes end-to-end. “No, he did not excel at an early age and has had to work for where he is at (today),” said Coach Loiacano. Seminole’s top point-getter in Katz also pointed out another characteristic that he’s come to admire from his new and fellow teammate. Players who usually receive compliments such as, “puck handling” skills and speed on the ice, from fellow teammates and opposing skaters typically have one of the better shots in the game. Loiacano could be categorized as a sniper, too. It was even joked about when River Ridge’s captain was asked about the plethora of highlight-reel goals he’s scored this season, but he also gave credit to his team’s starting goaltender -- that tends to actually stop his lethal shot often in practices. “My friend Daniel always gives me a tough time when he makes a glove save on me in practice,” Loiacano joked in reference to McCarthy robbing him of goals during practice. That seems to be the story of Loiacano’s senior season and his Knights race to the 2018 LHSHL Playoffs…a group of young skaters who love and enjoy playing the game, while embracing the moment with their fellow teammates and LHSHL peers.